Audi‘s Advanced State of Mind 3D campaign launching the Audi A8 L in India has won the Media Grand Prix at Spikes Asia this week. Online at audi-a8.in, the campaign invites viewers to explore the rear seat executive package, panoramic glass roof, rear seat entertainment, MMI with MMI touch, LED technology, night vision assistance and 360 degree exterior views. 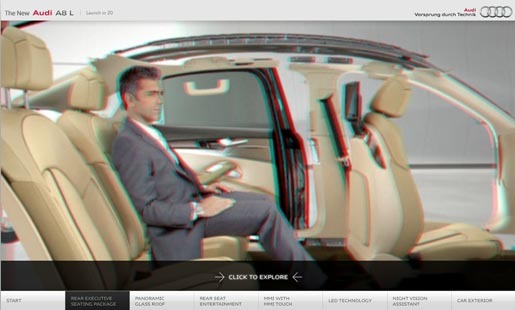 Launched in January 2011, the campaign included a direct mailer with a custom made high quality Audi anaglyphic 3D glasses and a full 3D car brochure, and iPad app. The Advanced State of Mind campaign was developed at Creativeland Asia by chief creative officer/ creative director/copywriter Sajan Raj Kurup, executive creative directors Vikram Gaikwad and Anu Joseph, copywriters Vinit Bharucha and Siddhartha Menon, art director Bryan Elijah, account producer Kiran Nandwani and account supervisor Aditya Subramaniam. Filming was shot by director Russell Tickner via The Mill and Crocodile Films with executive producers Andy Orrick (The Mill) and Sajiv Kurup (Crocodile Films), producers Ian Berry, Josh Davies and Kristyna Podolska. Post production was done at The Mill by editor Daniel Budin, assistant editor (digital) James Mortner, VFX producer Rahel Makonnen, shoot supervisor/3D lead artist Suraj Odera, 2D lead artists David Lee, Rob Rostek (Interface Design), Paul Kennerley (Art Direction, Digital), 2D artists Jerome Lionard, John Thornton, 3D artists Adrien Flanquart, Karl Shudeck, Dan Moore, Johannes Richter, Tom Bardwell, Yannick Lecroffe, Nikki Atkinson, Chris McDonald, Tom Raynor, motion graphics artist Adam Brandon, Ollie Walsh, Irrum Khan, and colourist Adam Scott.